The official soundtrack to this blog. I recently stumbled upon this band on youtube and have to support anyone who sings about Sparta. In this paper an overhead strike is discussed. With minor variations it appears as below. Now the above may all be true, but the Harmodios may not have been so dangerous and unlikely as thought by the authors above. 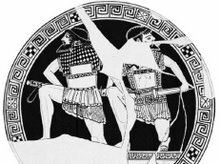 In fact the Harmodios blow might be one of the few strikes available to men who are standing in synaspismos, close order with overlapping shields. If men are in close as I have described previously, shield to shield, then the right arm needs to not only strike in this fashion, but also move in this way to ward the head. I have been experimenting with how one could fight in so close, with only the raised right arm given freedom of movement. The answer is very much like the harmodios blow. Better yet would be to adopt a shorter blade like the Spartans may have done. An interesting note on swords is that the sword (xiphos) is slung in a sheath high under the left arm, almost like a shoulder-holster for a pistol. I have been told by hoplite reenactors that this makes drawing the sword much easier in the confined space of a fighting phalanx. The manner of hanging the sheath may thus be yet another feature of the panoply designed for fighting in crowded conditions. "Prediction of human crowd pressures"
In situations where pedestrians are crushed, the density of the crowd is extremely high and the physical movement of pedestrians is almost impossible. When crushing occurs, the high pressures developed within the crowd, which can bend steel barriers or push down brick walls, can be unbearable to some members of the crowd, producing fatalities from asphyxiation while still standing. Generally, the highest pressures are felt by those pedestrians near any barrier that is checking the advance of the crowd. Such pressures will gradually restrict these people from breathing. Each time a breath is exhaled the weight of the load restricts inhalation of the next breath. A slow death caused by suffocation usually follows, unless rescue is immediate. The internal pressure in a crowd on the time scale of a minute or so is thus the critical criterion for determining the likelihood of an accident involving crushing in the crowd. Tests on live subjects conducted by Evans and Hayden (1971) found that the tolerable force was typically 623N for men when pushed against a 100mm wide flat bar. This force increased to typically 800N when the subject was allowed to push against the bar to reduce loading on his rib cage. For women, Evans and Hayden (1971) reported the tolerance levelwas significantly less. Apart from Evans and Hayden (1971), studies on exploring the magnitude of loadings that could cause crush asphyxia found that death was estimated to have occurred 15 seconds after a load of 6227 N and 4–6 min after 1112 N was applied, see Hopkins et al. (1993). It should be noted that loadings of such as these magnitudes are affected by various factors including age, gender and anatomical build. From the paper we can see the crushing force generated by the crowd at a rock concert over time (the lighter plot is a prediction, ignore it). The amount of pressure that is fatal to a human varies depending on the duration, since the asphyxiation can occur over time as described above. Very high pressure (6000+ N) can be almost immediately lethal. From the plot above we can see that over the time period of recording from 5-10 minutes, the crowd pressure was almost never below 800N and reached a peak of 1,500N. Since 623-800N were described as a tolerable limit above, and pressures of 1112N lethal, this crowd would have been intolerable and potentially lethal for most of the period. In the concert many people had to be passed out of the crowd and treated by medical professionals. and sustained loadings of typically 1.5 kN/m lasting for 10 minutes. Throughout the first half of an act the sustained average load was 0.8 to 1 kN/m. During the concert, people pressed against the barriers and in distress were rescued by being pulled over the barriers and being treated by medical staff. This paper had an interesting figure that showed how the pushing force could vary with the degree to which men leaned forward against the man ahead. How this would correlate with forces that hoplite would generate is not really known, but the important thing is to note that the behavior of the men in the crowd can alter the amount of pressure generated. As few as 4-8 men are producing lethal pressures (note the scale of the y-axis is Kilonewtons (1,000N). This data is not even from an especially dense crowd, they can be almost double that density and proportionally more deadly. The importance of this graph is that it shows that through behavior the amount of force generated by a crowd can be increased. Here simply leaning forward more transmits more force forward. The implication is that through training men can transfer greater force forward more efficiently. This, and other behaviors, is how the system can be tweeked to produce more with training. There are many elements that could be added to raise the realism of the model, but the most important thing is to show how a group behavior, such as phalanx combat, can be self-organized. In this model there is no leader. Each simulated hoplite is an "agent" endowed with a list of very simple responses. The only information they recieve is from their immediate surroundings- from the few men around them acting to push or fight them. One of the biggest problems that those who follow my blog have with my view of phalanx combat is that they don't see how such crowd-wide behavior could be coordinated. Rob's model gives an example, though I would change/add a variety of the details I've exposed in previous posts. I plan to create a model with those elements in the future.